This article was adapted a project presented in partial fulfillment of a master’s degree in City and Regional Planning at the University of North Carolina at Chapel Hill by Melanie Morgan under the guidance of Noreen McDonald, PhD. While there is no doubt that mass transit has many benefits, planners should be aware of these propensities for change when promoting TOD policies and must think critically about how implementation may affect diversity and equity in existing communities. As American cities expand, techniques for managing development are vital to questions of affordability, displacement, and accessibility. Carolina Planning Master’s program graduate Melanie Morgan investigated these issues in the context of Transit-Oriented Development. What is the role of Transit Oriented Development? Transit-Oriented Development (TOD) is aimed at creating neighborhoods that are within walking distance of transit stations, are environmentally sustainable, support physical activity by promoting mixed land use, and provide affordable housing options for residents of all race and class backgrounds. However, TOD in the United States is often marketed towards empty nesters and childless Generation Xers and Millennials who are willing to give up large homes in suburbs for proximity to cultural resources in the urban core. In fact, TOD marketing strategies target Gen Xers and Millennials and generally ignore low-income people, minorities, and families, all of whom are included in the stated values of TOD. With a rising population and a renewed interest in public transit systems, it is becoming increasingly important for planners to understand the impacts of implementing TOD projects. Morgan’s research project sought to examine how the presence of a rail station influenced demographic change in the first decade of the 2000s. Demographic changes in 3,285 station areas in 31 American transit systems were compared to changes in the city at large. The research concluded that the mere presence of stations does not appear to be a significant factor in demographic change when compared to metropolitan areas as a whole. Simultaneously, areas within ½ mile of rail stations grow differently than their respective counties, frequently in a way that decreases diversity. In addition to this broad conclusion, insight can be drawn from trends in specific cities. The index of change is designed to identify the rate at which stations are changing differently than the surrounding counties. 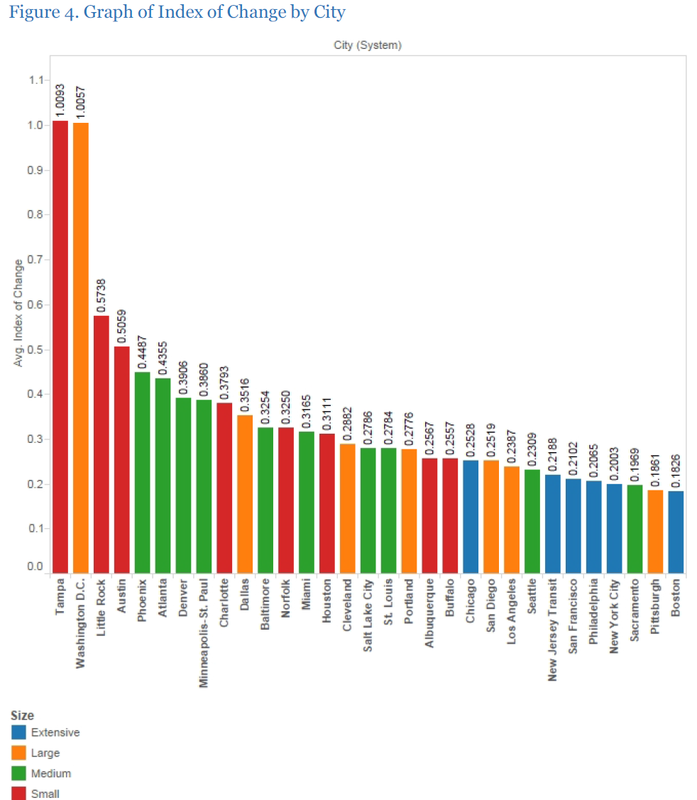 The components of the index include total population, total housing units, proportion of the population that is White, proportion of the population that is African American, proportion of the population that is Hispanic, proportion of the population that is children, proportion of the population that is elderly, total number of households, proportion of households that are families, proportion of housing units that are renter-occupied, and proportion of housing units that are vacant. Morgan drew an insightful conclusion from investigating one municipality’s neighborhood plans for rail stations and their effect on demographic change. In Minneapolis, Minnesota, the state’s first light rail system opened with much anticipation in 2004. In tandem with the light rail launch, Minneapolis imposed a development moratorium on areas along the line that did not have an approved neighborhood development plan. Some of the neighborhoods that would host new rail stations created plans for managing development, while others did not. Neighborhoods that made formal plans—such as Lake St. and 46th St.—experienced more demographic change around their stations than nearby neighborhoods that failed to make formal plans. 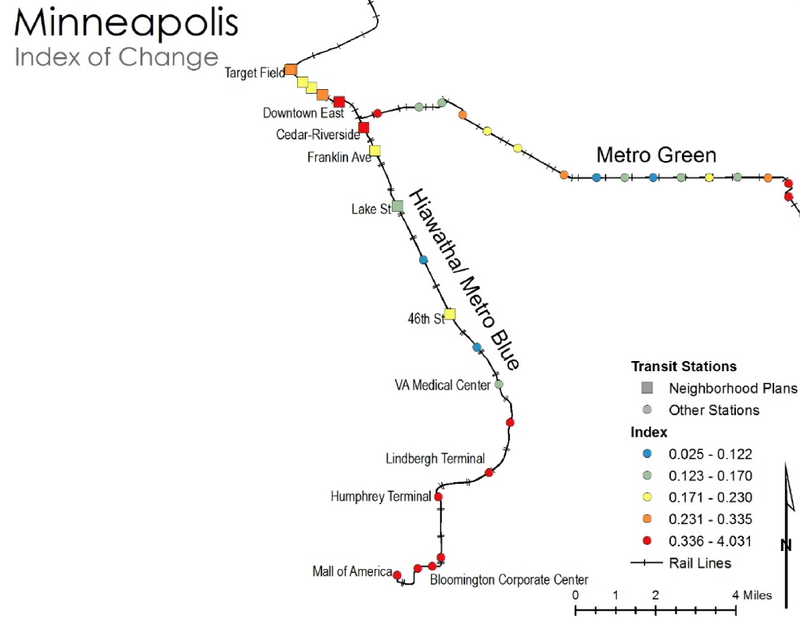 The index of change of stations varied across Minneapolis. As a whole, the findings presented in Morgan’s research indicate that areas within ½ mile of rail stations grow differently than their respective counties, frequently in a way that causes a decrease in diversity. While there is no doubt that mass transit has many benefits, planners should be aware of these propensities for change when promoting TOD policies and must think critically about how implementation may affect diversity and equity in existing communities. To visualize the data she collected, Morgan created a website featuring an interactive map, the methodology of her project, and the full report that she presented before her project’s committee in April. Melanie came to UNC with a Bachelor’s in public health and a desire to make it easier for people to walk and bike throughout cities. As questions swirled about a light rail system in the Chapel Hill area, she became interested in the impacts of new rail and transit-oriented development projects. Her master’s project on rail stations and demographic change was awarded the Terry Lathrop Award for Outstanding Work in Transportation Planning from DCRP. She is currently working as the Innovation Team Data Analyst for the City of Centennial, Colorado. Her team, funded by a 3-year, $1.5 million grant through Bloomberg Philanthropies, aims to embed innovation in local governments.